Over the past ten years the Washington Department of Ecology Office of the Columbia River (OCR) has spent $200 million financed by taxpayer-backed bonds in an attempt to build more dams and increase water supplies in eastern Washington. OCR is quite adept at touting its achievements, particularly when the legislative budget process rolls around. Wasted a lot of money investigating proposed new dams that it should have known could never be built. The report, Department of Ecology Office of Columbia River: The Last Ten Years, examines OCR’s decade long agenda of studying dam sites and developing water projects, with in-depth review of the Odessa Subarea water project, the Yakima Integrated Water Plan, and the Icicle Strategy . The conclusions are eye-opening. For example, OCR claims credit for “developing” nearly 400,000 acre-feet of water for new supply. Most of this is not “new” water, and instead would be re-allocated out of existing reservoirs. Of that water, most has not been delivered to water users. This is because of the enormous and expensive infrastructure needed to move water from the reservoirs to the farms that are the intended beneficiaries. 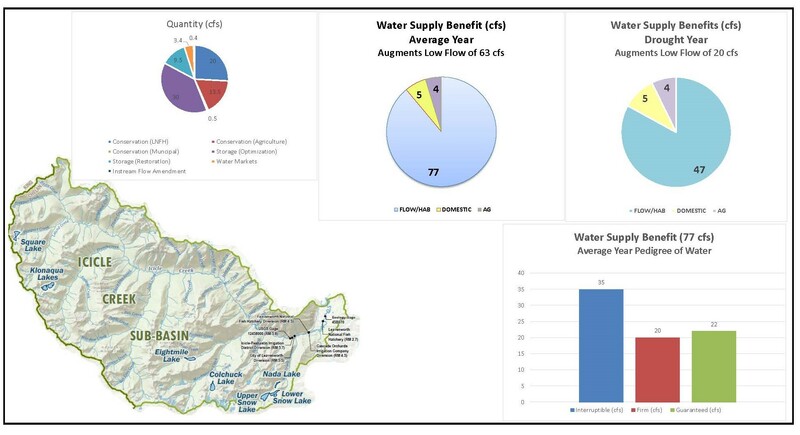 The Power Report also evaluates the Yakima Basin Integrated Water Plan, and concludes that assumptions about the benefits of its expensive water storage projects are speculative and implausible. The proposed storage reservoirs could cost Washington taxpayers as much as $2 billion. The Report builds on earlier studies that conclude the benefits of building more dams in the Yakima River watershed cannot be justified by the costs. A study by WSU’s Water Resources Research Center, “Benefit-Cost Analysis of the Yakima Basin Integrated Plan Projects,” concluded that the Yakima Plan’s proposed storage projects would result in economic losses. However, providing fish passage at existing reservoirs and utilizing water right markets, the Yakima Plan could achieve the goals of the Plan, but at a much improved benefit-cost ratio. The Power Report also evaluated the Odessa Subarea “groundwater replacement” program which involves pumping Columbia River water into an extremely arid portion of the Columbia Plateau where the potato industry has over-pumped the groundwater system for decades (primarily to produce french fries), and is now seeking a water bailout at public expense. OCR claims success, but the Power Report points out that only about 3,000 acres have been switched to surface water, with massive infrastructure – and massive public subsidies – required for the remaining 80,000 acres. The Power Report also evaluates the Icicle Strategy – a proposal to pump water from lakes in the Alpine Lakes Wilderness to provide municipal water supply to the City of Leavenworth. The Report notes the controversial nature of the project, given the extreme popularity of the Alpine Lakes Wilderness, and suggests that the problems of water supply be addressed through aggressive water conservation and development of regional water markets. More information on the Icicle Strategy can be found in this blog’s 4-part series New Dams and Diversions in the Alpine Lakes Wilderness and Icicle Instream Illusions. Alpine Lakes Wilderness Society (ALPS) also opposes the Icicle Strategy. The Power Report concludes in pointing out that the OCR has spent millions on studies of dams that were infeasible from the start. These include the Lower Crab Creek and Hawk Creek dam proposals, which would have flooded substantial amounts of wildlife habitat, and the Shankers Bend dam, which would have flooded into Canada. The bottom line? The Office of the Columbia River has wasted substantial amounts of public funding pursuing projects that were doomed from the start. The Power Report was commissioned by Sierra Club, which has long opposed dam building and dam operations in the Columbia Basin. Legislative testimony by Sierra Club and ALPS details the concerns about OCR’s 2017 budget request. Categories: Alpine Lakes Wilderness, Climate Change, Dams, Icicle Creek, Instream Flows, Leavenworth Fish Hatchery, Legislature, Office of Columbia River, Salmon | Permalink. In 1985, the Department of Ecology adopted an instream flow rule for the Nooksack watershed in Whatcom County. The rule establishes instream flows for 28 tributaries or points along the mainstem of the Nooksack River. The rule also establishes partial or full closures of about 50 rivers, streams, and lakes throughout Whatcom County, meaning that new water rights can no longer be appropriated for part or all of the year where these waterbodies are closed. Because of these closures, the Department of Ecology no longer issues water rights in Whatcom County unless those rights are conditioned to be interrupted when instream flows are not met. This happens often in the Nooksack watershed. 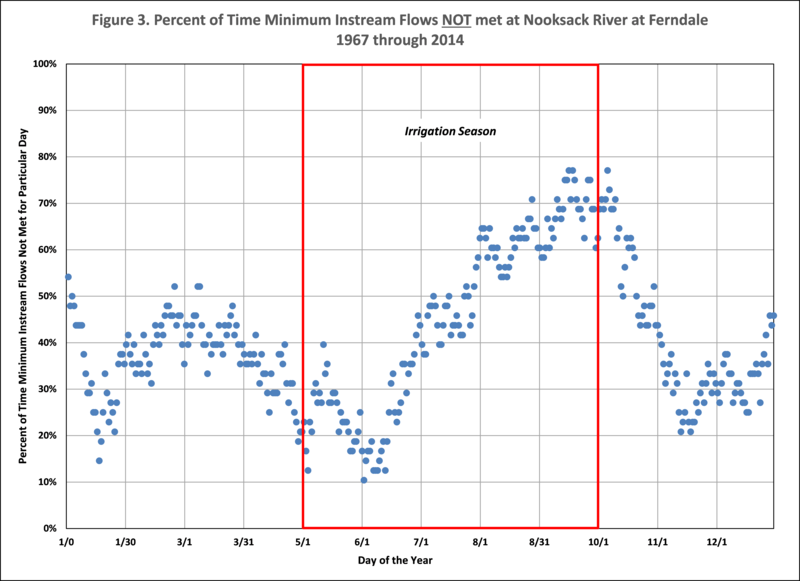 * For example, the graph at left shows that instream flows on the mainstem of the Nooksack River are not met up to 80% of the time during summer months. This low flow problem is evident in many of the tributaries in the watershed (and throughout the state, as discussed below). Despite these low flow problems and stream closures, Whatcom County has for many years issued building permits for new rural development that relies on permit exempt wells for water supply. It has long been understood that groundwater is connected to surface waters in the basin, and that pumping from wells captures water that would otherwise discharge to the Nooksack River and its tributaries. This hydraulic connection between ground and surface waters has important ecological consequences because groundwater inputs create cool water refugia in streams and rivers for endangered salmon and other aquatic species. Moreover, as climate change alters stream temperatures, groundwater inputs become even more important. Despite an enormous amount of scientific data showing that groundwater connects to and enhances surface waters, the County did not evaluate the impact of is rural growth practices on Nooksack instream flows. Whatcom County is required to prepare a comprehensive plan and zoning regulations under the Growth Management Act (GMA). The GMA contains several provisos that require counties to administer their land use laws in a way that protects water resources. ** In a 2011 case involving Kittitas County, the Washington Supreme Court held that counties must ensure that water is both physically and legally available when implementing land use laws that will result in development that relies on permit exempt wells for water supply. On October 6, 2016, the Washington Supreme Court followed up the Kittitas County decision, ruling in Whatcom County vs. Growth Management Hearings Board (also known as the “Hirst” case) that Whatcom County’s land use laws do not fulfill GMA requirements to protect water resources. 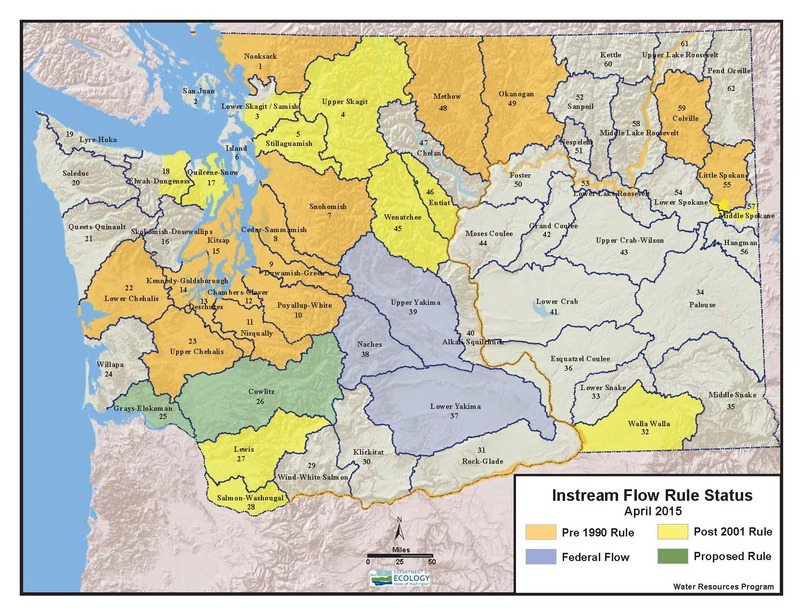 Instream flow rules represent water rights for the river that enjoy protection from more recent water diversions and withdrawals, such as those allowed under Whatcom County’s comprehensive land use plan and zoning regulations. Such withdrawals cause impairment of instream flows that is forbidden under Washington law. The Court further held that, when issuing building permits that plan to rely on permit exempt wells for water supply, it does not matter that the Department of Ecology has not closed a waterbody by instream flow rule. Ecology’s inaction cannot serve as a basis for counties to evade their duty to protect water resources and uphold water resource laws. As discussed below, this is a critical point given that a number of Washington’s instream flow rules are outdated and do not reflect the status of water availability. Hue and cry is expected from the development community and local land use agencies regarding the Whatcom County decision. The Court’s ruling calls into question existing practices of many counties that are doing exactly what the Court held illegal : issuing building permits without proper analysis of water availability. County land use practices are causing impairment of instream flows throughout the state. The use of exempt wells to fuel Washington’s rural sprawl has been going on since at least the real estate boom of the early 1990’s, much to the detriment of the state’s rivers and streams and the fish that need adequate flow for survival. A new report from the Northwest Indian Fisheries Commission, 2016 State of Our Watersheds, documents how permit exempt wells are directly harming treaty salmon fisheries in multiple watersheds in western Washington. As an example, 259 exempt wells were drilled in the Squaxin Island Tribe’s territories between 2010 and 2104 (adding to a total of nearly 6,000 such wells in the basin), damaging important coho and chum fisheries in Johns Creek, where the instream flow rule was adopted set in 1984. A Spokane County report documents that, in the Little Spokane River watershed, 8,900 exempt wells were drilled between 1976 and 2008, after the LSR instream flow rule was adopted, even though the river does not meet instream flows about 80% of the time. In fact, LSR surface water rights are frequently ordered to curtail in summer months, thus elevating junior permit exempt wells over senior out-of-stream water rights, as well as the regulatory instream flows. These are but two examples of situations that are virtually identical to Whatcom County. In reality, this problem is proliferating all over the state. The Court recognized that instream flows set by rule are protected as senior water rights, but held also that counties cannot rely on these rules to determine legal water availability. The Court’s decision on this point is important, because Washington’s instream flow regulations are woefully out of date. In the 1970’s and early 80’s the methods for identifying the quantities of water needed to protect instream values was very crude, the science of hydraulic continuity was not fully understood, and the problem of inchoate (paper) water rights was nowhere on the radar screen, nor were the treaty-based instream water rights of Washington’s tribes. Instream flow rules are simply not a reliable indicator of how much water is in a stream or aquifer, and how much is available for new appropriations, including exempt wells. For many years, there has been wholesale failure by the Department of Ecology, state lawmakers, and local authorities to rein in uncontrolled use of exempt wells. State economic policy has promoted growth at any cost, causing great harm to Washington’s waterways. By failing to step up and control groundwater use, the state and counties have left themselves open to lawsuits and adverse court decisions. This trend will continue until a more enlightened approach to water management prevails. Fundamentally, water managers must recognize that Washington’s water resources were over-appropriated many years ago. We have come to the end of the water frontier. 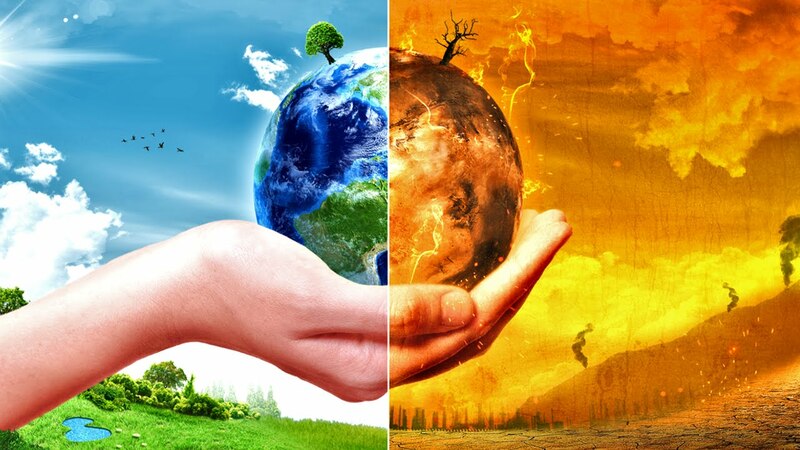 Indeed, with climate change baying at the door, we must find ways to use less water and restore water to streams and aquifers that are even now in sharp decline. A paradigm shift is needed and, with the help of the Washington Supreme Court, is getting underway. The GMA places an independent responsibility to ensure water availability on counties, not on Ecology. To the extent that there is a conflict between the GMA and the Nooksack Rule, the later-enacted GMA controls. Slip Op. at 10. The GMA requires that an applicant for a building permit for a single family residence or a development must produce proof that water is both legally available and actually available. But [Whatcom] County does not require any showing that water is available for a building permit when the applicant is relying on permit-exempt water appropriation. This failure by the County is the crux of this case. Slip Op. at 19. The Board found that [Whatcom County’s land use] provisions result in water withdrawals from closed basins and senior instream flows – flows that the record indicated drop below the minimum levels 100 days out of the year. The Board properly held that this conflicts with the requirement placed on counties to protect water availability under the GMA, as well as our holding in Postema, 142 Wn.2d 68. Slip Op. at 25. Counties may not rely on Ecology’s inaction in failing to close a basin as a determination that water is presumptively available for appropriation. Such inaction fails to provide any assurance that a new permit-exempt well will not infringe on senior water rights, and thus fails to satisfy the obligation the GMA places on counties to ensure that water is legally available before issuing a building permit. Slip Op. at 34, note 13. *Naiads has previously reported on Ecology’s shocking decision to issue interruptible water rights to illegal water users in the Nooksack watershed. See our posts: The Tale of the Nooksack Nine and Nooksack Water Thievery Redux. **For example, the GMA establishes a goal to “protect the environment and enhance the state’s high quality of life, including air and water quality, and the availability of water.” RCW 36.70A.020(10). Comprehensive plans must include a land use element that “shall provide for protection of the quality and quantity of groundwater used for public water supplies.” RCW 36.70A.070(1). The rural element of comprehensive plans shall protect “critical areas, as provided in RCW 36.70A.060, and surface water and groundwater resources.” RCW 36.70A.070(5)(c)(iv). Applicants for building and subdivision permits must demonstrate adequate water supply for their developments. RCW 19.27.097 and 58.17.110. Categories: Climate Change, Exempt Wells, Growth Management Act, Instream Flows, Land Use, Nooksack River, Whatcom | Permalink. After spending more than three years and a million taxpayer bucks, Chelan County and the Washington Department of Ecology have finally put out an environmental scoping request for the Icicle Work Group’s “Icicle Strategy.” This document identifies our government’s plan to further dam and drain several lakes in the Alpine Lakes Wilderness area for future consumption by Wenatchee Valley developers and irrigators. Complete details about the impact of the project can be found in the Alpine Lakes Protection Society’s (ALPS) latest newsletter. The SEPA checklist and various descriptions of the Icicle Work Group’s proposal are posted on Chelan County’s website. Here are a few observations that may guide comments. The Icicle Work Group asserts that this plan is environmentally beneficial because it will improve instream flows in Icicle Creek. This assertion is (largely) false. There will be minor improvements to streamflow, but most of the water promised to Icicle Creek is interruptible – that is – in water-short years the cities and irrigators will be able to take their full allotments of water regardless of how little is flowing in the creek. There will not be enough water to protect the endangered steelhead and bull trout that inhabit Icicle Creek. More analysis of these problems may be found in prior Naiads posts, such as Icicle Instream Illusions, and New Dams and Diversions in the Alpine Lakes Wilderness. The EIS must consider a Wilderness Protection Alternative. This alternative would promote wilderness values as set forth in the Wilderness Act of 1964, would not allow new water infrastructure or diversions inside the Alpine Lakes Wilderness, and would require all new water supply to be obtained outside the Alpine Lakes Wilderness. The EIS must consider a Water Conservation Alternative. This alternative would assess using aggressive water conservation measures by Wenatchee Valley cities, including restrictions on lawn watering (as the citizens of Seattle have learned to do). This alternative should also assess transfer of water rights from irrigation districts to cities, where orchards have already been torn out and replaced with residential subdivisions. This alternative should also assess agricultural irrigation efficiency, such as replacing open gravity canals with pipes and pumps and other 21st century concepts. A proposed Conservation Alternative is linked here. The EIS must consider an Irrigation District Water Right Change Alternative, which would fix Icicle Creek’s low flow problem. This alternative would evaluate moving the Icicle-Peshastin Irrigation District’s water right diversion, which presently takes 100 cubic feet per second out of Icicle Creek, to the Wenatchee River downstream about 3 miles. This measure, which would permanently fix Icicle Creek’s low flow problem, would convert the IPID diversion from gravity flow to pumping (requiring electrical power). The Icicle Work Group should therefore analyze renewable energy options to supply that power, including solar, wind and in-canal hydroelectric. The EIS must consider a Water Right Relinquishment Alternative. Removal of water from the Alpine Lakes Wilderness is on the table only because IPID holds water rights that were grandfathered when the Wilderness was created. And – as IPID will tell anyone who will listen – every year they use what they need. When the dam at Eightmile Lake fell down decades ago they didn’t fix it because they did not need more water. When a party doesn’t use their rights, they lose them. “Use It Or Lose It” – the basic rule of western water law – is controlling. The EIS needs to analyze this. The IWG’s plan to exploit the Alpine Lakes Wilderness is a camel’s-nose-under-the-tent proposal. As climate change alters the hydrology of the western U.S., we can expect to see many attempts to expand water projects that were grandfathered into wilderness areas. Wilderness advocates need to weigh in by May 11, for the sake of Alpine Lakes and for wilderness values in general. *The Alpine Lakes Wilderness Society (ALPS) was invited and declined to participate. The Center for Environmental Law & Policy (CELP) participated in IWG meetings for two-plus years and then resigned when the operating procedures were changed to gag CELP’s objection to wilderness water projects. Categories: 2015 Drought, Alpine Lakes Wilderness, Climate Change, Icicle Creek, Instream Flows, Leavenworth Fish Hatchery, Salmon, Wilderness | Permalink. 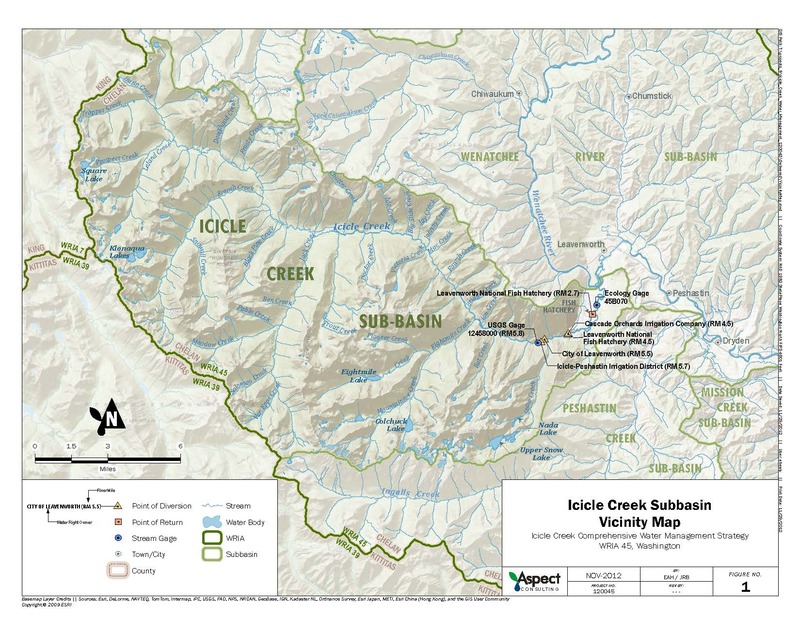 The Icicle Work Group, about which this blog has posted much, (see below*), has proposed an “Icicle Strategy” for achieving goals to manage water in the Icicle Creek watershed, which originates in the Alpine Lakes Wilderness and feeds into the Wenatchee River. This quid-pro-quo water management proposal would involve manipulating water levels and building a new dam at the popular Eightmile Lake in the Wilderness. The alleged benefit is that the water developed by these activities would be used to improve instream flows in Icicle Creek. We say “alleged benefit,” because if you look at the fine print, you’ll see that improvements to Icicle Creek instream flows are not guaranteed. The trade-off between harming Alpine Lakes Wilderness and improving Icicle Creek is a smoke and mirrors proposition. Wilderness and river advocates should not be fooled. The charts below tell the story. 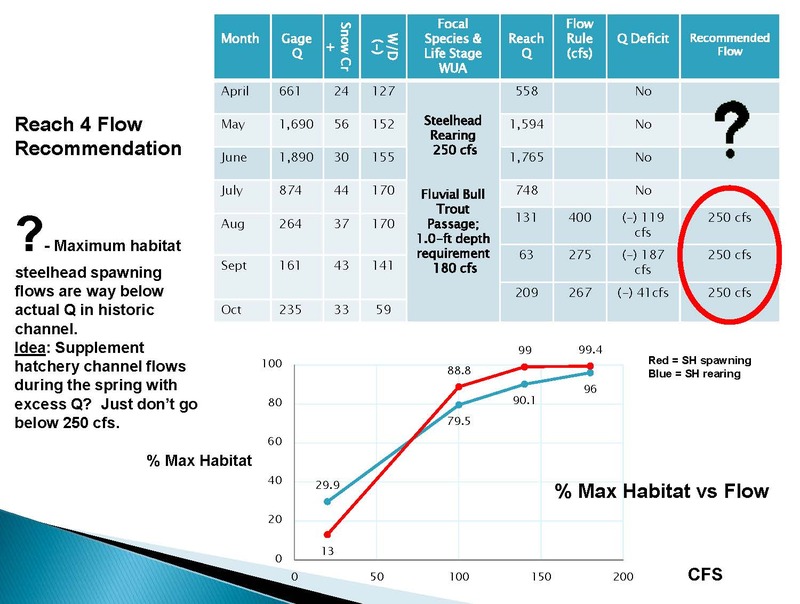 The blue, red and green bars indicate that of the 77 cubic feet per second (cfs) that the Icicle Strategy would add to Icicle Creek, only 22 cfs is actually guaranteed to be there, while 55 cfs is subordinate or subject to speculation (ie, 20 cfs may or may not be provided by the Leavenworth National Fish Hatchery at some unknown point in the future). Chart produced by Icicle Work (2015). Click here for larger version. Also of interest is that the four entities that divert water from Icicle Creek should be required to use water more efficiently and prevent harm to the instream habitat of threatened species (steelhead and bull trout). This is already required pursuant to state water laws and the federal Endangered Species Act, but these laws are not being enforced. 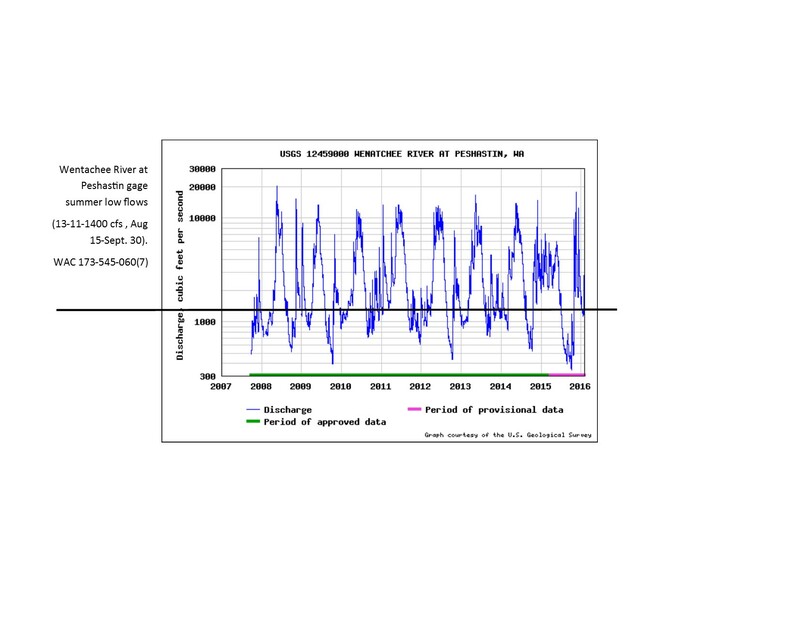 The benefit to Icicle Creek provided by the Icicle Strategy is illusory. The four Icicle diverters are Icicle-Peshastin Irrigation District (IPID), Leavenworth National Fish Hatchery, Cascade Orchard Irrigation Co., and City of Leavenworth. IPID claims it has a legal right to take more water from the various Alpine Lakes, but this is not true. To the extent IPID has water rights, whatever it hasn’t used has been relinquished. Use it or lose it – that’s the rule of western water law. The real purpose of the Icicle Strategy is to take more water out of the Alpine Lakes to serve urban and suburban growth and sprawl in the City of Leavenworth and other communities in the Wenatchee Valley. For background, see articles linked below. Public comments can be sent to mike.kaputa@co.chelan.wa.us, deadline May 11, 2016. 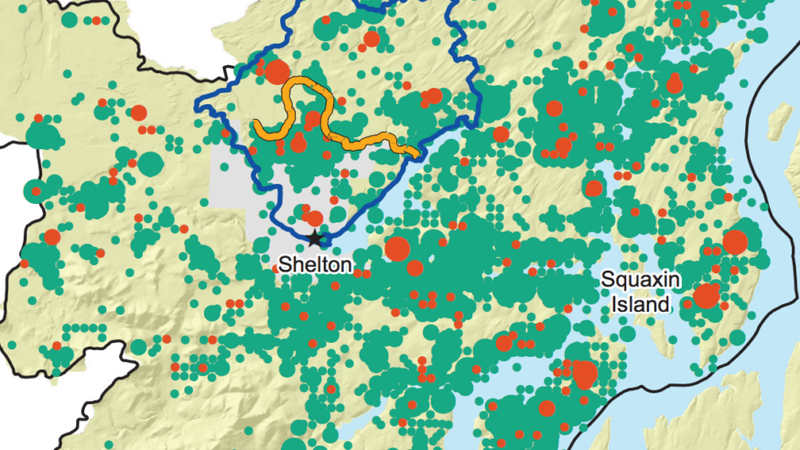 New Dams & Diversion In the Alpine Lakes Wilderness? Icicle Work Group – An Alternative View discusses the sham process by which the Icicle water management strategy is being created. 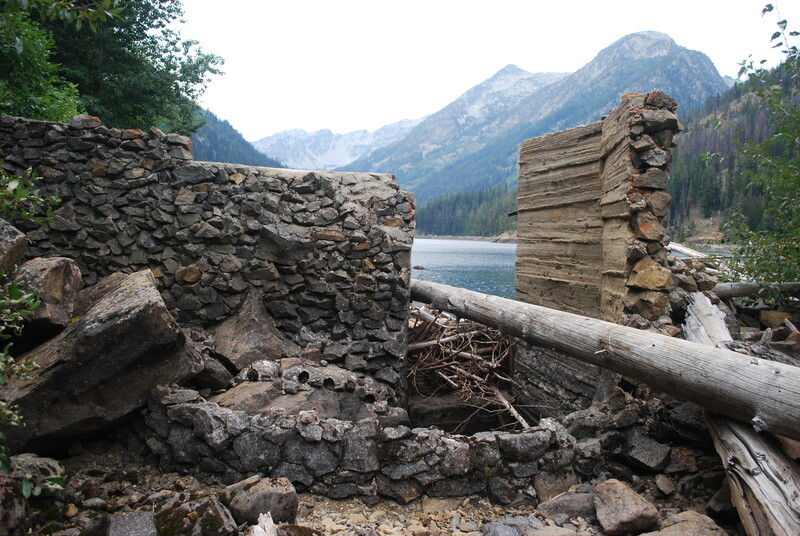 Dismantling the Enchantment Lakes by Pick & Shovel discusses the Icicle-Peshastin Irrigation District’s rights to divert water in the Alpine Lakes Wilderness. Categories: Icicle Creek, Instream Flows, Leavenworth Fish Hatchery, Western Water Law | Permalink. This article was published in the January-February 2016 newsletter of the Washington Chapter of the American Water Resources Association. This version contains additional graphics and links to websites and documents. Washington AWRA members were introduced to the Icicle Creek work group process at the October 2015 dinner meeting and in a follow-up newsletter article. Chelan County Natural Resources Director Mike Kaputa presented on the costly (in both time and money) process that various government agencies, water users, tribes and environmental groups are undertaking with the ultimate goal of diverting more water out of the already over-appropriated Icicle Creek watershed. This article offers a different viewpoint of the Icicle Work Group’s process and goals. The Icicle Work Group or IWG was established and funded by the Department of Ecology’s Office of the Columbia River (OCR) in December 2012 as a “collaborative process.” The IWG spent a year developing operating procedures based on consensus decision making, along with substantive goals that focused on environmental improvements and developing new water supply while adhering to state and federal laws. The IWG process targets an already over-appropriated water system. Icicle Creek drains a portion of the Alpine Lakes Wilderness area and discharges into the Wenatchee River near downtown Leavenworth. See Fig. 1. Four entities divert about 150 cfs from the Icicle upstream of the Leavenworth Fish Hatchery; two-thirds of that water is removed completely from the Icicle watershed to serve orchards in the Wenatchee Valley. Flows in some reaches of Icicle Creek are inadequate to support Endangered Species Act (ESA) listed bull trout and steelhead. Before launching into particulars, a disclosure is appropriate. On behalf of the Center for Environmental Law & Policy, I was invited to serve on the IWG and did so (along with CELP colleagues) from the outset. At the first meeting of the IWG I voiced CELP’s objection to a central element of the IWG’s strategy: artificially increased water storage in the Enchantment Lakes, in the Alpine Lakes Wilderness Area. In February 2015, concerned that the public was not being apprised of IWG proposals, I published articles about the Alpine Lakes project at www.naiads.wordpress.com (“New Dams & Diversions in the Alpine Lakes Wilderness?”). In June, the IWG proposed to alter its decision process from consensus to majority vote, and adopt a rule that members must screen their opinions with the IWG before publicly airing them. CELP resigned from the IWG when these amended procedures were adopted in July 2015. As with many water resource problems, there is a long back story to water management in Icicle Creek. Four different conflicts inform the work of the Icicle Work Group. This first conflict begins with the building of Grand Coulee dam without fish passage, an egregious injustice to tribes and the public that has yet to be rectified. To partially mitigate, the U.S. Bureau of Reclamation in 1938 built the Leavenworth National Fish Hatchery. The Bureau still owns and funds the Hatchery, which is operated by the U.S. Fish and Wildlife Service to produce chinook and coho salmon to meet federal trust obligations to the Confederated Colville Tribes and Yakama Nation. The Leavenworth Hatchery is a dilapidated facility suffering from decades of deferred maintenance, including relating to its water supply system. The Hatchery also blocks passage of ESA-listed steelhead and bull trout to the upper area of Icicle Creek – no small irony given that the USFWS is one of two federal agencies in charge of recovering endangered species. In addition to its physical infrastructure problems, the Hatchery operates without proper permits and conditions. Wild Fish Conservancy and CELP have brought a number of lawsuits against the Hatchery, including three ongoing cases relating to Endangered Species Act, state 401 Certification, and federal Clean Water Act violations. A second background issue involves a lawsuit between the City of Leavenworth and the Department of Ecology. In sum, in processing a water right change application in 1995, Ecology assigned an annual quantity to one of Leavenworth’s older water rights. Leavenworth did not appeal that quantification at the time, but recently sued Ecology to increase the annual quantity. A Chelan County judge ruled that Ecology’s 1995 quantification was a “tentative determination” that can be re-visited by the courts. The case is on hold in the Court of Appeals, a stay being obtained in 2013 based on Ecology’s promise to establish the Icicle Work Group and find more water for the City. The conflict boils down to 800 acre-feet annually, and Ecology is looking to provide that water via new appropriations out of the Alpine Lakes Wilderness area. This relates to the third background issue – the water rights of Icicle Peshastin Irrigation District (IPID) (technically these are two districts that share a manager). IPID holds rights to store and take water from several of the Enchantment Lakes – these rights were grandfathered when the Alpine Lakes Wilderness Area was established in 1976. See Fig. 2. IPID has installed various structures that control water flow from these lakes (“control” meaning that someone hikes up into the Wilderness in July to turn on the water, and then hikes back up in October to turn it off). When Ecology decided it would rather settle than fight the City’s lawsuit, it began to look at IPID’s wilderness water system as a source for the elusive 800 acre-feet. One of IPID’s rights is to store water at Eightmile Lake, where the dam structure collapsed so long ago no one remembers when it happened. See Fig. 3. If IPID could re-build the dam, and increase the water level of the lake, and if that extra water could be re-allocated to the City – well then, case dismissed and the Chelan County “tentative determination” order vacated. A final issue involves the Wenatchee River instream flow rule, first adopted in 1983. In 2005, Ecology amended the rule to update instream flows and add reserves to support new water rights in the Wenatchee Valley. These reserves would impair the instream flow established by rule, and are based on “overriding considerations of the public interest” or OCPI, set forth in RCW 90.54.020(3)(a). Alert readers will recall that OCPI reserves are no longer valid following the Supreme Court’s 2013 decision in Swinomish Indian Tribal Community v. Department of Ecology. This effectively squelched the County’s efforts to obtain issuance of new water rights, and has led to (thus far unsuccessful) attempts in the Legislature to revive the Wenatchee reserves. As an aside, the Wenatchee River and Icicle Creek routinely do not meet the Wenatchee rule’s instream flow targets during summer months. See Figure 4. This fact nicely illustrates the Supreme Court’s concerns about reserves impinging on the statutory mandate to preserve flows that support fish, wildlife, recreation and other instream values. With all this in mind, the Icicle Work Group was founded in 2012 as a consensus decision work group. The IWG adopted eight goals that seek both environmental improvements and new out-of-stream water allocations. In 2013, the OCR granted $885,000 to Chelan County to staff IWG with consultants and Ecology, WDFW and Chelan County employees. The IWG also pays $25,000 per year to IPID to fund its manager’s participation. Substantial legislative appropriations were made to support the IWG in the 2015-2017 biennium. Figure 5. Icicle Work Group Instream Flow Technical Subcommittee recommendations for instream flow in Icicle Creek Reach 4 (adjacent to Leavenworth Fish Hatchery) (2014). In 2014, the Work Group began to develop “metrics” to meet its goals. Identifying instream flow quantities necessary to meet fisheries needs in Icicle Creek, especially the de-watered reach adjacent to the Leavenworth Hatchery, was one consideration. IWG appointed a technical subcommittee of biologists, which recommended that 250 cfs was needed in order to maintain 100% of habitat for steelhead and bull trout life stages. See Figure 5. Certain Work Group members however, found these quantities unacceptable. The 250 cfs number was “negotiated” down to 100 cfs in good years, and 60 cfs in drought years. This would make 80% or less of potential habitat available for ESA-listed fish, a problematic goal by state and federal standards. See “metrics” and Fig. 5. 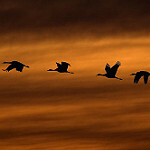 Some biologists have expressed doubt about the scientific foundations of this compromise, but when questions were raised, the IWG was informed that the decision could not be re-visited. This process raises fundamental questions about the propriety of agency participation in “collaborative” groups. With consensus, all parties have veto. But IWG rules now require participants to support the metrics and project list. Agency commitment to outcomes in advance of public and environmental review is troubling, especially for regulatory agencies such as Ecology, Washington Department of Fish & Wildlife, the U.S. Forest Service, and NOAA. Also problematic is the approach to meeting these compromise flows. 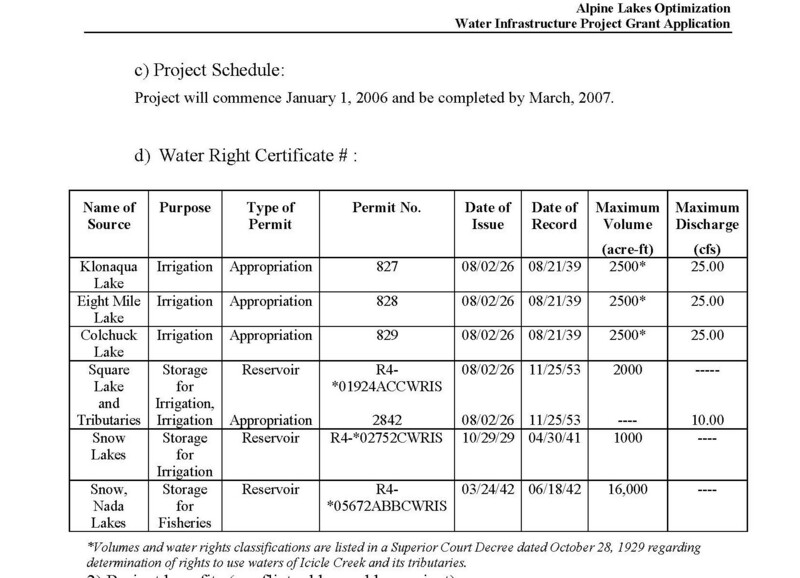 The current project list identifies only 22 cfs of “guaranteed” instream flow water – the rest would be interruptible. In a bad year, like the summer of 2015, Icicle Creek flows would plummet and temperatures skyrocket, while human users get the water they need. 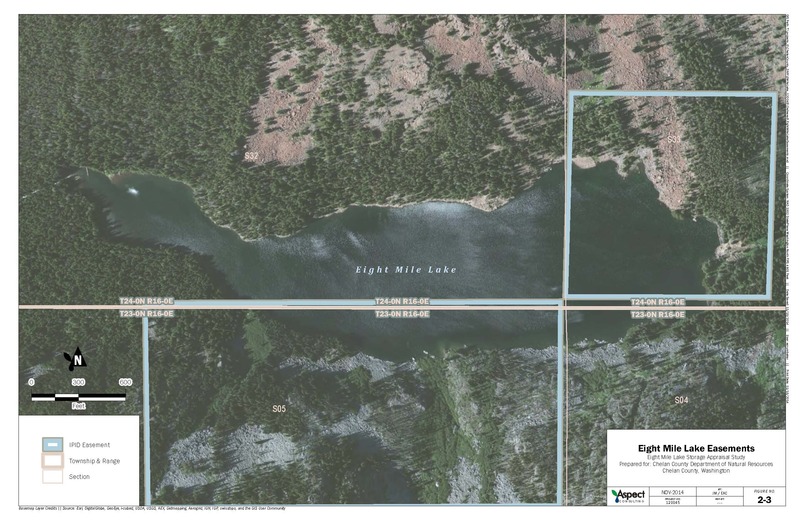 Proposals to manipulate storage at Eightmile and other Enchantment Lakes, where IPID insists it has the “right” to expand its wilderness water system, are of great concern to the environmental community. The Alpine Lakes Wilderness is a crown jewel of the federal wilderness system and Eightmile Lake is one of its most popular trails. While the IWG has done some outreach, conservation community responses have had zero impact on development of the project list. Beyond the failure to address public concerns, neither Ecology nor IPID has easements to flood wilderness surrounding the lakes, nor can the U.S. Forest Service give away public lands. See Fig. 6. 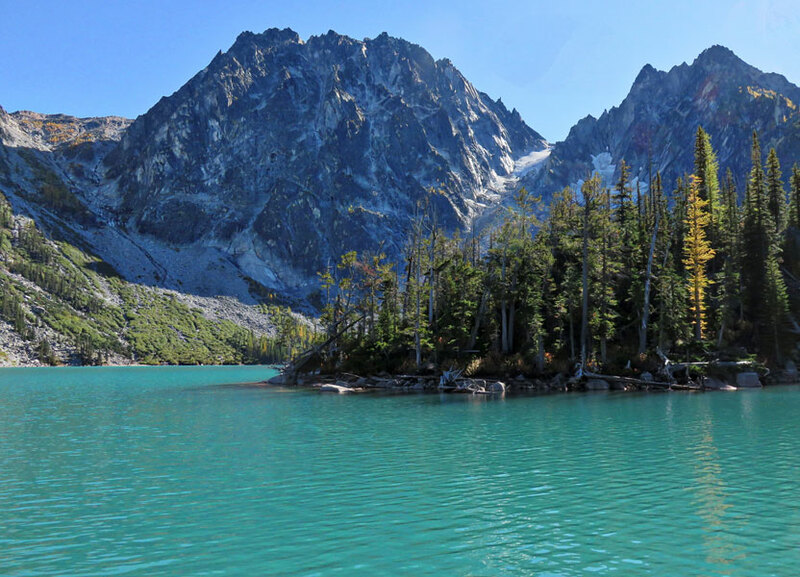 Yet expanded storage in the Alpine Lakes is the IWG’s linchpin project – so important that it changed its rules in order to outvote CELP’s viewpoint. Indeed, CELP was directed to stop asking questions about these issues at IWG meetings. The most expedient way to put 100 cfs into Icicle Creek is to move IPID’s diversion five miles downstream, from the Icicle-Snow Creek confluence to the Wenatchee River. However, IPID’s board voted to prohibit the IWG from considering this option. These actions raise interesting questions about the scope of water entitlements. Is a water user guaranteed their means of diversion, in this case miles of gravity-powered conveyance, that cause substantial environmental impacts? Prior to resigning, CELP proposed that the project list should focus on rigorous conservation rather than new storage. 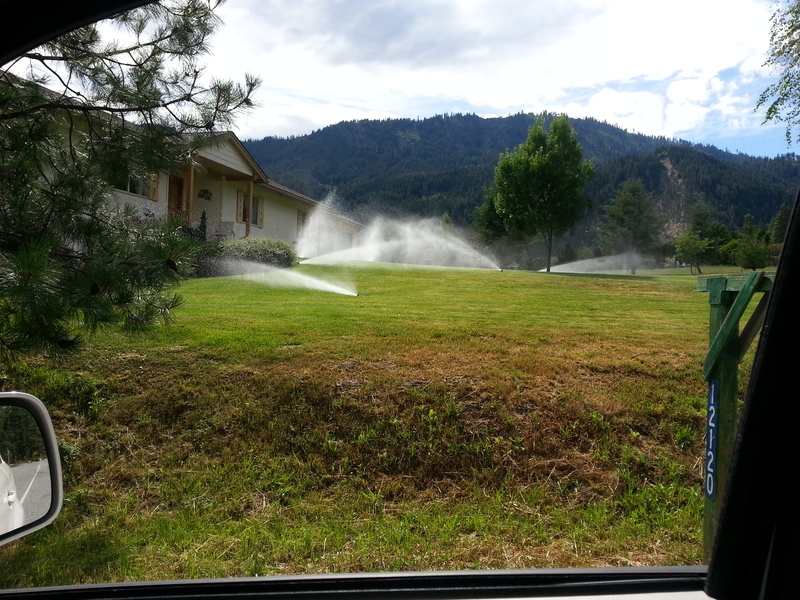 An informal tour of the Leavenworth area in June 2015 produced a photo album of conservation opportunities, including IPID canal-side phreatophytes, orchard over-irrigation, and excessive residential lawn watering. See Fig. 7. Municipal demand has declined, and the City does not project significant need for future customers. Indeed, the City recently approved selling water to the Leavenworth Ski Hill for snowmaking in 2016. While the current IWG project list includes some conservation, IWG water users resist meaningful measures. Chelan County’s IWG website does not reveal when or how the IWG plans to move forward. The IWG was on track to begin SEPA scoping in autumn 2015, but when the legislature allocated IWG another $1-2 million for the 2015-2017 biennium, the process slowed. These funds will easily support the IWG battalion of consultants and agency staff for at least two more years. State and federal coordination over environmental review (SEPA and NEPA) has also been difficult. One of the consequences of “integrated planning,” i.e., the lumping together of varied projects, is that affected agencies spend large amounts of publicly funded time to iron out procedures, turf conflicts, and other issues. First, as a matter of law and of biology, instream flows in Icicle Creek must be returned to more normative, historic levels. It is wrong to use legally required flows as a trading chit to obtain new out-of-stream water rights. This is particularly so given that the target sources are the Enchantment Lakes in the Alpine Lakes Wilderness. Second, the IWG is not a collaborative process. The inability of the Work Group to contend with dissent – and its change in operating procedures to silence particular viewpoints – seriously undermines its legitimacy. Skepticism should be the response when the IWG extols the virtuosity of its group-think process. Finally, public expenditures for the IWG and its projects should be re-evaluated. Ecology could purchase or condemn 800 acre feet of water for far less than the $64 million dollar tab that the IWG is about to drop on the public. It is the responsibility of the Bureau of Reclamation and USFWS to bring Leavenworth Hatchery into compliance with state and federal laws. It is the duty of the four Icicle Creek water right holders to ensure they do not harm endangered salmonids, and to employ 21st century water efficiency practices. It is the mandate of the regulatory agencies to secure this compliance, not negotiate it away. Ultimately, if an accurate picture is presented, the public will not pay for the sins and omissions of Icicle Creek diverters. Why are we spending millions to get that picture?